The UK economy will be worse off after Brexit regardless of the terms of departure from the EU: this is (with a small number of exceptions) a consensus reached by previous analyses of the impact of Brexit. Anything that differs from the status quo of EU membership – ranging from a ‘soft’ Brexit that involves staying within the Customs Union and/or the Single Market to a ‘hard’ scenario of leaving the EU with no deal – will hurt growth prospects for the UK economy. This analysis is further supported by the findings of the Government’s EU Exit Analysis: every UK region will be negatively affected in all Brexit scenarios, with financial services, manufacturing and retail among the industries worst hit. In our briefing paper – Which Manufacturing Sectors Are Most Vulnerable to Brexit? – we look at the impact of five Brexit scenarios on 122 manufacturing sectors and also find that none of the Brexit scenarios leads to a positive outcome for UK manufacturing. In particular, our modelling suggests that manufacturing output in the UK may fall between 2.1 per cent (if the UK remains a member of the European Economic Area, EEA) and 5.5 per cent (if the UK leaves the EU without a deal). Importantly, losses in output are likely to translate into job losses. With considerable variation in how different sectors will be affected by Brexit and how those sectors are distributed across the United Kingdom, the impact of Brexit will be felt very differently in different parts of the country. The local impact will depend on what the key industries are in a given area, how much is traded internationally and who are the main trading partners. To explore this further, we translate the projected output effects into employment vulnerability across 380 local authority districts in Britain. All areas will see job losses in high and medium-high tech manufacturing sectors. However, the job gains in medium-low tech sectors like food processing will outweigh the losses in high and medium-high sectors (resulting in a net gain of jobs) in a sixth of the local authority districts. Looking at the possible impact on UK regions, our results closely mirror those of the Government’s impact assessments. If we aggregate our results for the ‘hardest’ (no deals) Brexit scenario into employment effects for the 12 regions of the UK, we find, like the Government, that the North East is hardest hit, followed by the West Midlands. In further analysis, that explores the regional employment effect for different Brexit scenarios, we also find that the North East and the West Midlands may be most vulnerable. Figure 1 shows the change in manufacturing employment by region: for every 100,000 economically active residents in the North East and the West Midlands, more than 400 manufacturing jobs would be lost if the UK leaves the EU with no deal and fails to agree any other trade deals with other countries. In absolute levels, these numbers translate to more than 5,000 manufacturing jobs lost in the North East, and more than 11,000 lost in the West Midlands. Some of these losses may be offset by gains in lower-tech sectors. This explains why for some regions total manufacturing employment loss is less than high and medium-high tech manufacturing employment loss. This will be most pronounced in Northern Ireland and Yorkshire and the Humber. 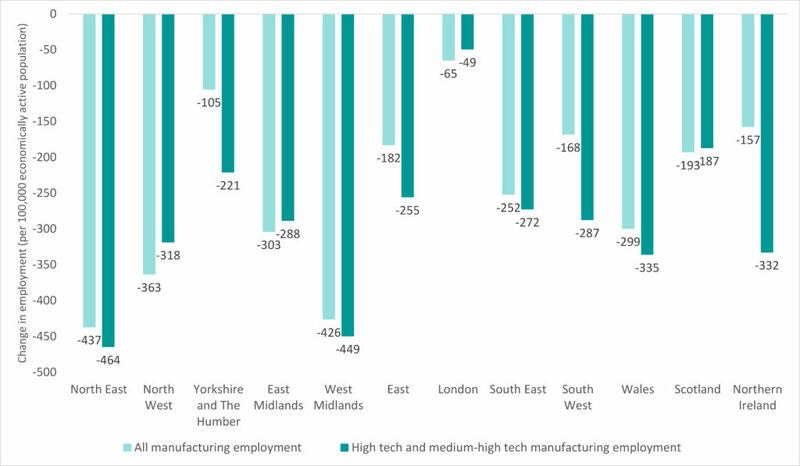 On the other hand, in four other regions (North West, East Midlands, London and Scotland) even medium and medium-low tech sectors will see job reductions. Employment losses in the high and medium-high tech sectors are of particular concern. This is because high tech sectors make the largest contribution to economic growth: the multiplier effect – where one job creates a number of other jobs in the local economy – is higher for the high tech industries than traditional manufacturing industries. But while every job matters, the scale of these losses (even for the most negatively affected North East region) may seem relatively small. It must be emphasised, however, that this impact comes from the possible loss of manufacturing employment alone – which represents (just) 10 per cent of the British economy. This means that possible total employment loss from Brexit will be much larger if we were to account for the impact of Brexit on non-manufacturing sectors (remaining 90 per cent of the UK economy). Whilst our findings on the most vulnerable regions support those of the Government’s impact assessments, we do differ in our predictions on the impact of Brexit on Northern Ireland. Looking only at manufacturing employment, as we do, suggests that Northern Ireland will be among the least negatively affected regions. Although possible employment loss in the high and medium-high tech manufacturing sectors is much higher. The local economy of Northern Ireland, more than other parts of the UK, is heavily dependent on the fortunes of the agri-food sector. The Confederation for British Industry notes that the sector is heavily reliant on EU funding and barrier-free access to the Republic of Ireland and the rest of the EU, and also particularly reliant on EU workers. With a third of the total trade between Northern Ireland and the Republic of Ireland being in animals and food, the EU average tariff for agricultural products of 22 per cent, would leave many farmers across Northern Ireland vulnerable and locked out of their markets south of the border. In our paper, we do not model the impact of Brexit on agriculture, but for food processing industry we find that domestic production may expand production after Brexit. This is in contrast to the Government’s analysis, which suggests that food and drink may be among the most negatively affected sectors of the UK economy. Without knowing the full modelling framework that underpins the Government’s impact analysis, it is difficult to stipulate why we arrive at such different conclusions on the possible impact of Brexit on food processing / food and drink sectors. But it is important to note that in our study we are not making ‘predictions’ about precise sectoral effects of Brexit. More definite conclusions would require deeper sector-specific analysis, for example, consideration of how the effects of Brexit on agriculture translate into the effects of Brexit on food processing, but also the impact of Brexit on the availability of labour. In sum, our analysis suggests – and supports the Government’s EU Exit Analysis – that Brexit will negatively affect manufacturing employment in all UK regions, with the North East being hardest hit. It is abundantly clear that the harder the Brexit and the larger the departure from frictionless trade with our main trading partner: the EU, the greater the impact will be on jobs and the UK economy. The greatest shame is that regardless of the forecasts and studies conducted before the vote, people still listened to the most accessible rhetoric. Communication and accessible language are key. The parties promoting the exit knew full well how to make use of the Daily Mail and the kind of language the audience is opened to listening. Research, stats and data are more than useful to back up any arguments, but they need to be presented in a way that people will be willing to listen to and understand.